When making an arbitrary list of your ten favourite games of the year, it's always difficult to choose which game is places where, let alone what makes that list to begin with. Even though I have my personal top ten, there are always those titles who just barely missed the mark. Hence, why I feel the need to give them honorable mentions. In some respects, the following games can be interchanged with numbers ten and nine respectively. They are both fantastic titles, but there were just a few things that the other games did better. But just by a tad; I can't stress that enough. 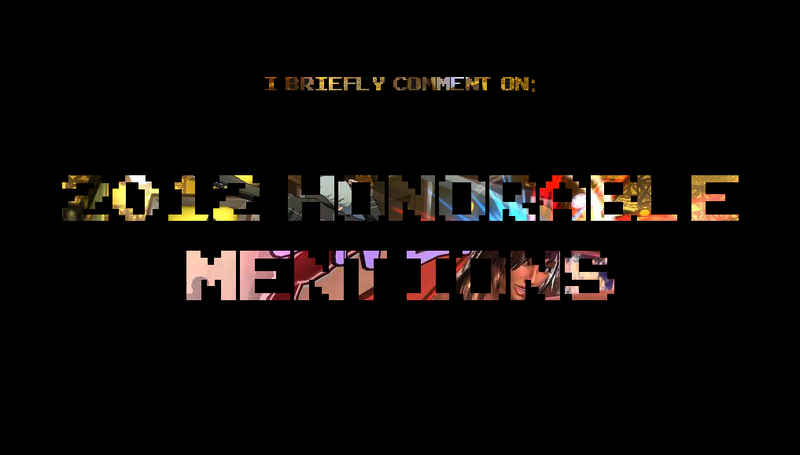 Here are my honorable mentions of 2012. I’ll just get this out of the way. I love the Dance Central games. The first installment in the franchise is the reason I own a Kinect, while DC1 and 2 have both taken a spot in my top personal top 10 games for the past two years. With Dance Central 3, it’s more of the same, but the same is still great. This year, developers Harmonix have added a slew of different features that help make the game feel fresh. The one thing that stuck out to me the most was the inclusion of a story mode. I know, the idea of a dancing game having a story mode sounds pretty ridiculous. However, considering that it revolves around traveling through time to prevent dance crimes, I think the Boston-based developed already knew that. The story is light hearted and provided me with some laughs. Other than that, the dancing is still superb. I personally find the game’s setlist to be the best one yet, and the routines that accompany them are fun to play. I also appreciated the inclusion of an unlockable progression bar. 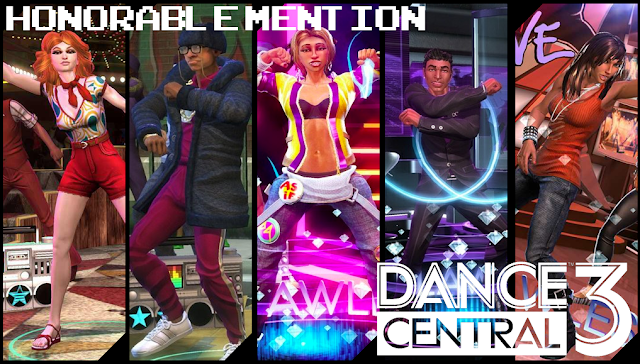 Sure it’s a concept that almost every game incorporates now, but I feel that it works well in Dance Central 3. I mean, who can resist just one more song, when you know you’ll unlock something right after? The original Playstation 2 release of Persona 4 holds a special place in my heart. It was the first Persona game I had ever played, and what an introduction to the Shin Megami Tensei franchise as a whole. To date, I have only completed the game once. In that one playthrough I had invested over one hundred hours just interacting with the characters the game presented, and grinding away inside its dungeons. I absolutely loved every moment of the game. The battle system was fun, and I didn’t mind dedicating hours to one dungeon, just killing everything I could find until I was seven levels above its boss encounter. It was the characters however that made me fall in love with this world. Watching the relationships between each one of them unfold was definitely something special. These interactions were well written and charming. Once the adventure was all said and done, it was weird saying goodbye to something I had spent so long with. I had to mention that because when I found out that Atlus was releasing a fighting game that further explored the world of Persona 4, my heart instantly jumped. I then found out that fighting game masters Arc System Works was developing the title and it began to sound like the perfect package. I’m not a great fighting game player, but I did love how the game actually played. The sprite based character models looked gorgeous during battles, and the whole thing moved at a smooth yet frantic fashion. I appreciated the use of a universal auto combo, which allowed for players to pull off a spectacular combo with the mash one a button. Sure it was like activating baby mode, but it did make me feel good considering I become dumbfounded when it comes to actually doing fighting game combos for real. 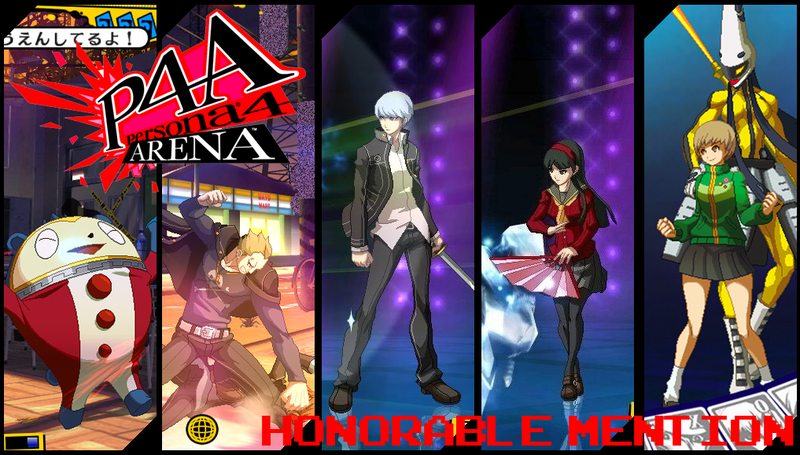 While the fighting mechanics led to some very fun times brawling it out with my friends, it was Persona 4 Arena’s story mode that had me most excited. As mentioned earlier, it further explored the Persona 4 world, while intertwining it with a few members from Persona 3; another title that I had invested myself in when its Playstation Portable counterpart came out two years ago. The story was presented in a visual novel format, with the occasional in game fight to break up the walls of text. It’s funny that I mentioned the PSP re-release of Persona 3, as it’s partly the reason why Persona 4 Arena isn’t cracking my personal Top 10. Persona 3 Portable (P3P) took everything I loved about P4, the story telling, the character interaction, the hours of grinding, and condensed it into a form where I could take it on the go. During moments of down time, I found myself grinding it out in a dungeon, or advancing a character’s “social link” relationship. The fact that I could bring this game with me where ever I went suddenly made the idea of playing through such a massive game so much easier to swallow. Then came Persona 4 Arena, where I was forced to read through its story mode in front of my TV. Maybe it’s something I could have done two or three years ago, but the idea of just reading text on a screen for hours on end was something that just wasn’t clicking with me. If Persona 4 Arena’s story had been presented to me on a portable device, something I could read when I was on the bus or on my work break, it would be something I would have appreciated much more. Instead, it was a story that I couldn’t bring myself to finish, which is a shame considering that I loved Persona 4’s previous carnation to death. Regardless, Persona 4 Arena is a solid package, which provided me with hours of fighting game fun. The main story mode portion that I did read through was great, and seeing some of my favourite characters of all time return was definitely moving. It’s too bad that I couldn’t experience it in a different fashion.